This paper presents the results of laboratory experiments on the relevance of reputation for trust and cooperation in social interaction. We have extended a repeated investment game by adding new treatments where reputation is taken more explicitly into account than before. We then compared treatments where the investor and the trustee rate each other and treatments where the investor and the trustee were rated by a third party. The results showed that: (i) third party reputation positively affects cooperation by encapsulating trust; (ii) certain differences in the reputation mechanism can generate different cooperation outcomes. These results have interesting implications for the recent sociological debate on the normative pillars of markets. 1.1 Trust and reputation have recently become key issues in economics and sociology (e.g. Cook, Hardin and Levi, 2005; Gui and Sudgen, 2005; Barrera, 2008; Barrera and Buskens, 2009), not to mention organization sciences and the growing literature on e-markets and communities (e.g. Zacharia and Maes, 2000; Jackson, 2004; Sabater and Sierra, 2005; Chang et al., 2006). This interest has two main reasons. Firstly, globalisation has changed the market landscape towards more complex and unpredictable patterns. The increasing knowledge-based source of goods and services exchanged through dispersed market networks has transformed uncertainty, information ambiguity and asymmetry into rules of the game. 1.2 Therefore, economic actors tend to rely upon social norms and networks to reduce strategic and operative uncertainty, achieving relevant market information and establishing workable agreements with partners (Raub and Weesie, 1990; Granovetter, 2002; Buskens and Raub, 2002; Burt, 2005) rather than solely relying on prices as standard information signals. Secondly, the prominent role of the Internet and on-line communities such as e-Bay in mediating market transactions requires management systems that can guarantee social control, accountability and mutual trust by embodying reputation incentives and social norms that maximise cooperation. It is therefore natural that scientists are interested in studying self-regulating enforcement mechanisms and informal, unplanned and spontaneous institutions, to understand how these factors could promote higher social order from the bottom-up (e.g. Guennif and Revest, 2005; Fehr and Gintis, 2007). 1.3 This paper aims to look at the relation between reputation, trust and cooperation in social interactions (Ostrom, 1998) by illustrating certain recent laboratory experiments. In these experiments, we have extended a previous repeated investment game (Keser, 2003; Boero et al., 2009) adding new treatments where reputation is taken more explicitly into account. We have compared treatments where reputation scores are expressed by the same investors and trustees involved in the interaction, and those where the investor and the trustee are rated by a third party. Moreover, we have focussed on two different reputation mechanisms. In the first one, reputation scores are assigned and transmitted by third parties. In the second one, we explored a gossip-like situation by allowing reputation scores to be formed by the same players involved in the interaction, but transmitted by a third party to other players (e.g. Conte and Paolucci, 2002). 1.4 Does a third party reputation mechanism generate the same cooperation as dyadic reputation? What is the consequence of a gossip-like third party reputation mechanism on trust and cooperation? These are the research questions we set out to address. 1.5 The paper is organised as follows. In the second section, we summarise past experimental evidence on trust and reputation and illustrate the added value of an experimental approach to social norms. The third section introduces the experiment, while the fourth presents the results. The fifth section elaborates the results and suggests future development. 2.1 Recently, significant advance in understanding cooperation and social norms has been made by the so-called "experimental behavioural sciences", where these issues are investigated experimentally (e.g. Henrich et al., 2005; Gintis et al., 2005; Fehr and Gintis, 2007). One of the most important ideas behind this approach is that experimental methods can help understand: (i) the micro-foundations of human behaviour in social interaction and, (ii) the aggregate consequences of individual behaviour (Camerer, 2003; Bowles, 2004). 2.2 Although not recognized as the discipline's principle approach, experimental studies have advanced in sociology. As emphasized in a recent survey, sociologists have relied on experimental approaches for a long time and they were among the first to use experiments to study social phenomena (Bohnet, 2009, 639). While Berger, Cohen and Zelditch (1972) initiated a prominent line of experimental research on status in sociology in the early 1970s (Troyer and Younts, 1997; Ridgeway and Erikson, 2000), Marwell and Ames (1979) initiated the systematic study of the voluntary provision of public goods in the late 1970s. 2.3 Other examples of social issues experimentally investigated are power (Cook et al., 1983; Molm, 1986; Markowski, Willer and Patton, 1988), crime (Andrews 1980; Horne and Lovaglia 2008; Rauhut and Junker 2009) and social norms (Lawler and Yoon, 1993; Kollock, 1994; Buchan, Croson and Dawes, 2002) to name only a few. Some important methodological debates on the pros and cons of experimental methods in sociology trace back to the beginning of the 1930s (e.g. Chapin 1931, 1932) and continue to today (e.g. Gee, 1950; Swanson, 1951; Willer 1987; Willer and Walker 2007; Bohnet 2009). Notwithstanding these advances, the experimental approach has been used more in economics and in psychology than in sociology. "sociological theory has not developed a coherent, broadly accepted framework that facilitates cumulative scientific progress and explains the emergent aggregate patterns of social behaviour in terms of individuals' preferences, their beliefs, and the social and economic constraints they face. Nor has sociological research developed a parsimonious, empirically grounded view of the basic motivational driving forces of human behaviour, which may be due to the role that controlled experiments played in the development of the discipline. [...] Most empirical work in sociology is based on non-experimental methods [...]. This is unfortunate because the experimental method permits cumulative empirical and theoretical progress through rigorous testing of alternative theories, the establishment of causal relationships between key variables, and the replicability of results. In contrast, non-experimental field data rarely permit a clean discrimination between theories, the inference of causality is typically not possible from these data, and replicability often proves difficult or impossible". the possibility to control variables and factors by external manipulation. 2.6 The reason for these points is as follows: in lab experiments: (a) individuals are subjected to incentives, (b) the rules of the game are clearly defined and easily understandable, (c) what is being observed is the concrete behaviour of subjects and not a self-representation by the subject him/herself (as during an interview) (Boudon, 1990), (d) the presence of the observer does not affect the behaviour of the individuals (unlike a field observation), and (e) it is possible to manipulate some theoretically crucial factors (e.g., incentives, rules of the game, interactions) and verify their consequences at the micro and macro level of analysis (on the advantages of the experimental method, see Smith, 1987; Hey, 1991; Selten, 1998). 2.7 The most common criticism of sociological experiments is the fact that: (i) they are highly abstract, artificial and unrealistic, (ii) players are not embedded in dense social relations as frequently happens in the real world, (iii) motivation is unrealistic, since players compete for relatively small stakes, (iv) the players' time horizon during experiments is limited (e.g., games take 30-40 minutes), whereas in reality decisions unfold over years and require time to be formulated, and (v) the typical experimental subjects (i.e., students) are not representative of the population as a whole. This criticism underlines important points that are worth considering. "the force of this criticism does not seem to lie in its implication that there is something inherently undesirable about the study of an event that is made to occur at a given time and place as the result of a conscious act of an experimenter as compared with the study of the same event when it occurs in 'nature' without such conscious planning. If event X taking place in the laboratory is the same as event X taking place outside the laboratory, generalizations about its nature in one setting will apply equally well in the other". 2.9 As Swanson correctly argued, it is counter-productive to keep the sociological debate on experimental methods at a merely methodological level. Indeed, all the advantages of the experimental method would be a blunt weapon if "all the precision, flexibility, and validity in the world [...] could be had only in studying problems that were insignificant to develop a systematic body of theory about collective life" (Swanson 1951, 354). If this is true, each method should be evaluated simply on the explanatory achievements it could guarantee. 2.10 However, the degree to which experimental evidence can be generalized to concrete social settings is a relevant issue that experimentalists have taken seriously. The current methodological debate is focused precisely on the need to increase the "external validity" of laboratory findings and the link between experimental, field and empirical research (Ostrom, 2006; Levitt and List, 2007; Gerring and McDermott 2007). This is achieved by running experiments with non-standard and sometimes more representative subject pools and testing experimental evidence in field experiments, sometimes conducted in cross-societal contexts with more representative subject pools (Hayashi et al., 1999; Fehr et al., 2002; Buchan, Croson and Dawes, 2002; Henrich et al., 2005; Ostrom 2006). 2.11 The criticism that the limited size of experimental subject pools can have an influence on sociological realism of the interaction setting was addressed by Swanson after the 1950s. He emphasized that the small microscopic scale of the laboratory allows for a readily observable scale, by facilitating "the refinement of hypotheses that are necessarily gross when we are limited to the study of interaction in larger, less accessible units" (Swanson 1951, 357). Therefore, a small scale can allow sociologists to dissect social mechanisms that can have broader implications for large groups and societies. 2.12 The criticism that the small size of stakes can influence the subjects' behaviour is not so relevant, as robust findings have shown that in most situations raising the stakes does not imply any relevant change of the subjects' behaviour compared to standard experimental stakes (Camerer and Hogarth 1999; Cameron 1999; Camerer 2003). The same is true for the criticism that the limited time horizon of decisions that usually take place in the laboratory is artificial compared to real social situations. There is enough evidence that human subjects, as boundedly adaptive rational agents, tend to apply fast and frugal heuristics in many decision domains of their everyday social life and not only when they undertake ordinary decisions (e.g. Gigerenzer and Selten 2002). The pressure of time, uncertainty and information asymmetries which characterize experimental settings are the same that characterise many domains of social life. There is no evidence of a causal relation between the length of time of a decision's consequences and the length of time of the decision itself. 2.13 Finally, making experiments more realistic and in particular, more embedded in social contexts, though a desirable end in itself, has both a pre-condition and a consequence (Bohnet 2009, 641). On one hand, the long tradition of laboratory experiments in social psychology and behavioural economics has proved that experiments are reliable to understand the mechanism underlying human behaviour even outside the laboratory exactly because of their initial abstraction (e.g. Ariely, 2008; Camerer, 2003; Webster and Sell, 2000). 2.14 On the other hand, experimental abstraction can be seen as a crucial guide to conduct theory-informed empirical research. By dissecting social mechanisms, it can help understand whether the complexity of human sociality in the real world enhances or hinders laboratory findings (Boudon 1990). For example, being able to measure the effects of reputation in an experimental setting means that we can identify certain social mechanisms that are also likely to be found outside the laboratory. New studies based on more traditional empirical methods are complementary rather than alternative to experimental research. We should try to identify these mechanisms and their scope in the real world, so extending a cumulative process of knowledge. 2.15 A good example of experimental research in trust and reputation studies is Keser (2003), where reputation is introduced into a repeated investment game. In this game, first introduced by Berg et al. (1995), the investor (A player) decides how much of his/her endowment to send to the trustee (B player), who receives the amount sent multiplied by a given factor greater than one (usually three). Subsequently, B decides the proportion of the received amount to return to A. In this baseline game, the subgame perfect equilibrium, assuming that actors are rational and self-interested, is for B to return nothing and consequently for A to keep all his/her endowment. Nevertheless, experimental evidence shows that investors are willing to send on average about 40-50% of their endowment, while trustees return slightly more than the amount sent (Berg et�al., 1995; see also Camerer, 2003). 2.16 Keser's design extends this baseline game by introducing a reputational opportunity. Subjects interact for 20 periods with random opponents, but A players are allowed to rate the behaviour of their opponents. In the following period, the reputation scores of B players are presented to investors before their investment decision. The result of Keser's experiment is that the possibility of relying on others' experiences significantly increases cooperation by providing incentives for A investment and promoting B returns. This is consistent both with previous experimental results on direct and indirect reciprocity and with theoretical studies showing that, when interaction is repeated over time, the possibility of knowing others' past behaviour significantly increases cooperation (e.g. Novak and Sigmund, 1998a, 1998b, 2005; Fehr and Fischbacher, 2003; Seinen and Schram, 2006; Bravo and Tamburino, 2008). 2.17 Boero et al. (2009) extended Keser's experiment by allowing both A and B to rate their opponents. Their baseline game was a standard repeated investment game: (i) in each period subjects are randomly assigned to the role of A and B; (ii) both player A (the investor) and player B (the trustee) received an initial endowment of 10 experimental currency units (ECU), having an exchange rate of 1 ECU = 1.5 Euro cents; (iii) player A decided his/her investment and the invested amount was tripled and sent to player B in addition to his/her own endowment; (iv) B chose the amount to return to A; (v) the sums earned by both players in the current period were shown to both subjects. 2.18 They added three new treatments to the basic experiment. In the first (indicated as treatment 1), A was allowed to rate B's behaviour as "negative", "neutral", or "positive", as in Keser's study. The subsequent A players interacting with B were informed of the last reputation score received by the latter before making their investment decision. The second treatment (treatment 2) was exactly like the previous one except for the fact that now B was allowed to rate A. This information was available in the next period for the subject playing as B with A players who were already rated. 2.19 As in previous cases, possible scores were "negative", "neutral" and "positive" and this information was shown to the B players before their decision. Note that, in rational terms, this reputational information on the past behaviour of A players should have had no practical consequences on B's decisions. B players are not in a risk situation and cannot invest on their own reputation (not being rated). They should therefore base their decision on the actual amount sent by A players rather than on their past reputation scores. As a consequence, A players should have no rational incentive to invest reputation. 2.20 As shown in Boero et al. (2009), both predictions were wrong: A players significantly increased their investments compared with the baseline while B players tended to return more to investors with a positive reputation. Finally, in the third treatment (Treatment 3), both A an B players were allowed to rate each other and knew the scores in the following period before their investment/return decision, leading to a significant increase in both investment and returns. 2.21 On one hand, Boero et al. 's (2009) results confirm Keser: humans are highly sensitive to their reputational status and react promptly to other people's judgement and reputation increases cooperation in this game. On the other hand, their results show that there is a rational and a cognitive/normative side of reputation. For the first, the repeated investment game emphasises the interest of B players in building a good reputation in order to benefit from higher investment from A players. In this case, reputation becomes a source of learning (for A players) and control (for B players) (Buskens and Raub, 2002; Barrera and Buskens, 2009), since the availability of reputational information helps A to learn about B's trust responsiveness and B to signal his/her trustworthiness to A. This allows players not to be trapped into a sub-game perfect equilibrium of no trust/no trustworthiness and makes cooperation a possible and robust outcome. 2.22 Regarding the second side of reputation, Boero et al. (2009) showed that reputation also matters when any practical consequences of reputational information for players' pay-offs is ruled out (see experiment 2 in Boero et al., 2009). In conclusion, although a large part of the reputation effect is due to strategic investment (e.g. Bolton, Katok and Ockenfels, 2004; Barrera, 2008), new experimental results corroborate the hypothesis that individuals also attach a cognitive flavour to reputation . 2.23 The strength of reputation is also confirmed in some studies on gossip. Reputation does not necessarily need to be grounded on direct knowledge of past behaviour of other individuals, since individuals can exploit the many sources of information available in social life, nor it is only closely related to reciprocity mechanisms (e.g. Conte and Paolucci, 2002; Janssen, 2006; Hahn et al., 2007). Gossip does play an important role in transmitting reputational information in society (e.g. Burt and Knez, 1995; Dunbar, 1996; Kurubawa, 2005; Ferrin, Dirks and Shah, 2006). Some recent experimental studies show that gossip strongly influences the behaviour of subjects even when they can use other information sources, e.g., direct observation (Sommerfeld et�al., 2007). Another experiment showed that individuals react to the possibility of being the subject of gossip by increasing their contributions in a dictator game (Piazza and Bering, 2008). The hypothesis explaining this evidence is that reputation embodies some normative references for humans which increase the likelihood of trust and cooperation, such as the value of others' judgment for personal well-being and increase commitment towards others' well-being when reputation is put into context. 3.1 Although interesting, these results are limited by the fact that the reputational mechanism has only been investigated under dyadic relations, while in the real world third parties often play a crucial role in judging one's actions and in spreading information about their behaviour. We therefore designed a "third-party investment game", where a new subject is introduced into the game as either "evaluator" or "informer". 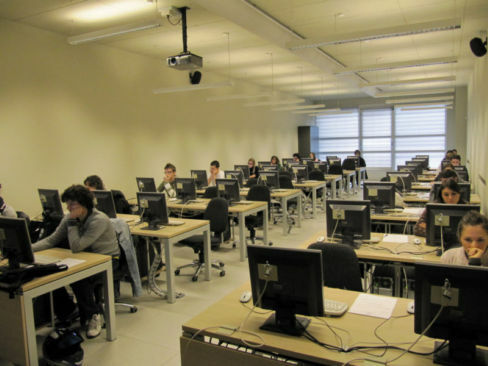 This new experiments took place over two days in the computer laboratory of the Economics Faculty of Brescia University, using the experimental software z-Tree (Fischbacher, 2007). There were 126 students recruited through public announcement in various faculties, i.e., Economics, Law, Engineering and Surgery & Medicine. 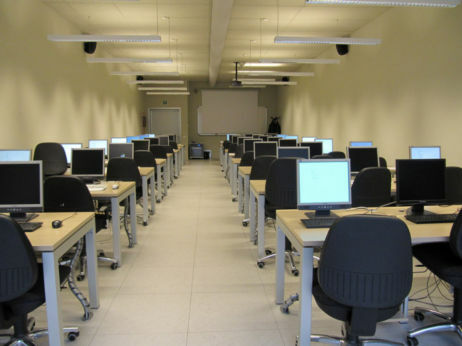 All interactions took place through the computer network and the subjects were unable to identify their counterparts (see Figure 1). The subjects played 25 periods in all and were informed in advance of the duration of the game. The game took nearly one hour (including instructions) and the average earning was 15 Euros, which was paid immediately after the experiment. 3.2 The experiment consisted of four new treatments (called C1, C2, C3 and Inf). The instructions of C1 displayed to subjects were as follows: (1) subjects were randomly assigned as A, B and C players each period (they played on average the same number of period in each role at the end of the game); A was the investor, B the trustee and C the evaluator (third party); (2) player A (the investor) received an endowment of 10 experimental currency units (ECU), having an exchange rate of 1 ECU = 1.5 Euro cents; (3) A decided how much to send to B (the trustee) between 0 and 10; (4) B received the amount sent by A tripled plus an endowment of 10 experimental currency units (ECU); (5) B decided how much to return to A; (6) the sums earned by both players in the current period were displayed to both subjects; (7) C observed the amount exchanged between A and B and assigned a reputation score to B ("neutral", "positive", or "negative"). This score was made available between step 2 and 3 to the next A player who interacted with the B player who had been rated. In case of no rating available, e.g., when players had not yet played in a B's role, as in the initial periods, the player appeared to the counterpart as "unknown". To sum up, treatment C1 was identical to treatment 1 with the exception that reputation was assigned by a third party (the C player) and not by the A player. 3.3 The instructions for C2 were the same as C1 with the exception that now C players were called to rate A's behaviour. As before, C2 was different from treatment 2 as reputation scores were assigned by the third party and not by B players. In treatment C3, C players observed and rated both A's and B's behaviour and reputation scores were transmitted to both. As before, C3 was different from treatment 3 because reputation scores of both players in the exchange were assigned by the third party. 3.4 Finally, treatment Inf was similar to C1 with the exception that B's reputation was not assigned by C players but by A players and scores were transmitted to C players who decided whether to transmit or not the scores to subsequent A players. Before deciding, C players knew the reputation score that the A ones obtained the last time they played as B. The difference between treatments 1, 2 and 3 and C1, C2 and C3 lay in the origin of reputation scores (direct vs. third party). The difference between C1 and Inf was that, in the latter case, C players were simply informers (or "gossipers"), who did not have any direct responsibility on the quality of reputational information they transmitted. 3.5 Socially, it is probable that reputation also takes place when people relate to reputational information at second hand, such as in gossip (e.g. Conte and Paolucci, 2002). Treatment Inf was therefore aimed at observing the impact of a gossip-like reputation mechanism on trust and cooperation. 4.1 The results of treatments C1, C2, and C3 compared with those in Boero et al. (2009) presented above: treatment 1 with C1 (B players are under rating), 2 with C2 (A players were rated), 3 with C3 (both A and B players were rated). Table 1 shows averages and standard deviations of A investment, B returns and B returns as proportion of B endowments for each treatment. 4.2 In treatments 1 and C1, before deciding whether and how much to invest, A knew the reputation score of B assigned by the previous A at the end of the last period (treatment 1), or the reputation score of B that was assigned by the previous C (treatment C1). B returns are important to understand whether B was interested in building a good reputation in A's eyes. Results showed that the introduction of a third party basically replicated the high level of cooperation of treatment 1, which is significantly higher than in the repeated investment game without reputation (Boero et al., 2009). A investments and B returns were even higher in absolute terms, although B returns in proportion to the endowment were essentially the same. A Wilcoxon Rank Sum Test on individual averages shows that the distribution of B returns did not significantly differ across the two treatments neither in absolute terms nor as proportion of the amount received (see Table 2). Table 1. Mean and standard deviation of A investments, B returns and B returns as proportion of the amount received plus B endowment. Table 2. Wilcoxon Rank Sum Test results on the distribution of amounts sent and returned. Binary comparisons, treatments 1-C1, 2-C2, and 3-C3. (p values are two tailed). 4.3 In treatments 2 and C2, before deciding whether and how much to return to A, B was allowed to use the A's reputation score. In this case, B was in the position to use both his/her direct evidence (how much A has sent her/him) and A's past reputation. This second information source would not make great sense if B players behaved as 'purely' rational agents. The results showed that C players essentially generated the same cooperation level of treatment 2 and higher than in the standard investment game. More precisely, A players invested slightly more in treatment 2 than in treatment C2 (see Table 1), even if the difference was not statistically significant (see Table 2). Similarly B players returned slightly more (6.59 against 5.83), but again the difference was not significant either in absolute or proportional terms (see Table 2). The same situation occurred comparing treatments 3 and C3: both investments and returns C3 were slightly lower than in treatment 3, but the difference was not significant at the 5% level (see Table 2). 4.4 The similarity of the corresponding treatments in Boero et al. (2009) and in the current experiment was confirmed by looking at the average of B's as function of the reputation scores assigned by A. 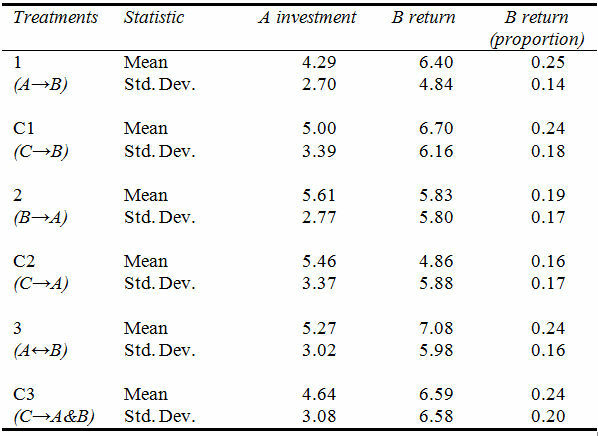 In both treatments 1 and C1, the reputation scores obtained by B players clearly depended on their returns and followed a similar logic (see Table 3). Moreover, in both treatments A investments rationally followed the reputation scores with B players having a negative reputation receiving less than the ones with a positive reputation. Table 3. Average return by reputation score obtained by B players in treatments 1 and C1. 4.5 Figure 1 shows the dynamics of A investments and B returns over time in the different treatments. Results indicate that the third party reputation mechanism guaranteed on average a higher level of cooperation at the beginning of the game. Cooperation did not increase or tended even to decline as the periods continued. This meant that, when B players were being rated, third-party reputation was viewed both by A and B players as a more reliable reputation system than dyadic reputation (this would explain the higher level of cooperation in the first periods of the game). Nevertheless, third-party reputation systems seemed to be more sensitive than dyadic reputation ones to fluctuations of strategies during the game and tended to produce lower cooperation in the final periods. 4.6 In treatment Inf, C players no longer acted as evaluators, but simply transmitted the reputation score assigned by the previous A to the players with whom they were coupled in the current period. While the role of C was different, the reputational structure of the game was similar to that in treatments 1 and C1. The result of treatment Inf showed that A invested on average 4.16 ECU (sd = 3.11) and B returned on average 4.36 ECU in absolute terms (sd = 5.28), and 0.17 in proportion to the sum received plus his/her endowment (sd = 0.18). While the amounts invested were somewhat lower than in treatments 1 and C1, but the difference was not significant, the difference in returns was significant, as confirmed by a Wilcoxon Rank Sum Test comparing treatments Inf with 1 and C1 (Tab. 4). In other terms, B players no longer chose to invest in their reputation and returned lower amounts than in the other two treatments. Table 4. Wilcoxon Rank Sum Test results on the distribution of amounts sent and returned. Binary comparisons, treatments 1-Inf, C1-Inf. (p values are two tailed). 4.7 It is worth noting that in most cases C players decided to transmit the reputation score. More precisely, overall they sent B's reputation score to A players in 67% of cases. When B players had a negative reputation score, C players decided to pass it in 62% of the cases, when B had a positive one in 72%, when B had a neutral one in 60%. When the reputation score was unknown, i.e., at the very beginning of the game, it was transmitted in 81% of cases. 4.8 As before, the reputation score that A players assigned to B players was clearly linked to the amount returned: A assigned a negative score when B returned on average 2.26 ECU (proportional return 0.09), a neutral score when B returned on average 4.44 ECU (prop. 0.20), and a positive one when B returned on average 9.27 ECU (prop. 0.32). No significant effect was played by past reputation scores of A players. When A had a previous negative reputation, C players decided to transmit him/her the current B's reputation score in 48% of cases, in 21% when he/she had a positive reputation score and in 31% when he/she had a negative reputation score. They decided not to transmit the B's reputation score in 52% of cases when A had a negative reputation, in 24% when he/she had a neutral score and in 34% when he/she had a positive score. Overall, the past reputation score of A players did not appear to mean much to C players. 4.9 This last point makes us to conclude that the discretion of C players in treatment Inf as such did not significantly affect the game. However, if this is true, what else could explain the relatively worse performance of this reputation mechanism compared to treatment 1 (direct reputation) and C1 (third party reputation)? 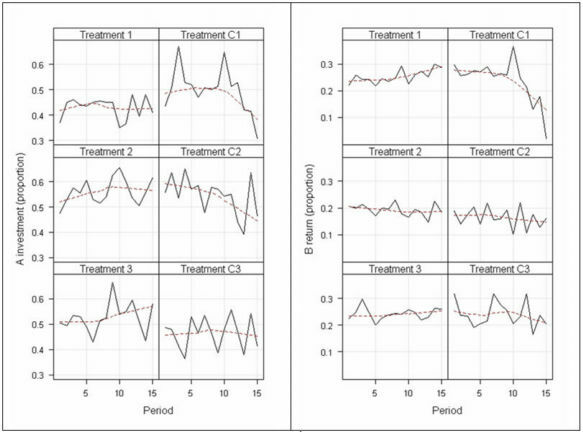 4.10 Figure 2 shows the dynamics of B's returns over time in treatment Inf. The evidence is that at the beginning of the game, players started by cooperating but in a few periods cooperation started to decline, as shown by the smoothed line in Figure 2. The fact that players started by cooperating means that they understood the game and did not approach it from a negative bias. The patterns of players' behaviour were relatively stable and were not affected by random factors. 4.11 To understand this pattern, we dissected the impact of reputation scores in treatments 1, C1 and Inf (see Figures 3, 4 and 5). The comparison shows that treatment Inf had a predominance and persistence of negative scores. At the end of the last period, 69% of B players had negative reputation scores, 51% of which kept a negative score nearly throughout the game (see Figure 5). One possible explanation is that A players started to cooperate and to invest but B players returned less than in treatments 1 and C1. This, in turn brought about negative reputation scores for B players, reduced investment by A players and weak incentives for trust and cooperation. 4.12 There is a two possible explanatory mechanisms for B's behaviour. Firstly, B players decided to return little because they may have suspected cheating behaviour from the "gossipers" (i.e., C players), who could decide not to pass along their possible positive reputation to A players. Secondly, B players decided to return little because they thought that C's did not have any concrete incentive to pass A players their possibly negative reputation. The point is that the C role was viewed by participants as a source of uncertainty in the reputation mechanism, even if this was not true, as our analysis above showed. 4.13 An explanatory hypothesis is that players thought that "gossipers" were not responsible for the quality of the reputational information they were called to spread, because scores were expressed by other players. On the contrary, the introduction of the third party reputation mechanism in treatment C1 was viewed as a stable, largely predictable reputation mechanism, exactly because in this case, C players were responsible for the score they were called to pass along. The evidence is that our gossip-like reputation mechanism did not guarantee the same level of trust and cooperation that was guaranteed by the third party reputation mechanism, where C players called to assign reputation were fully responsible of the reputation they handed out. Figure 3. Sequence of B's ratings in treatment 1. 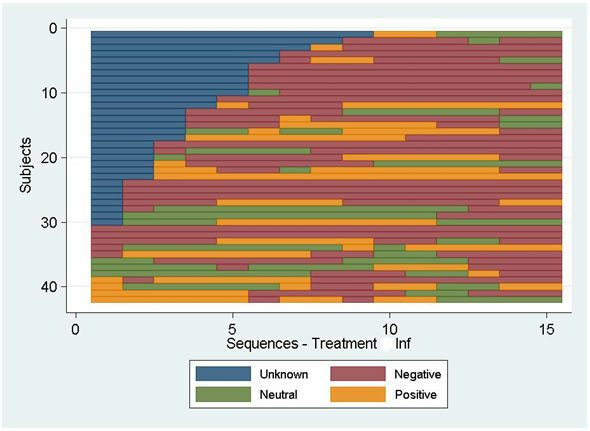 The figure plots with a different colour the rating obtained by the subjects participating in the treatment for each period of the game. Figure 4. Sequence of B's ratings in treatment C1. 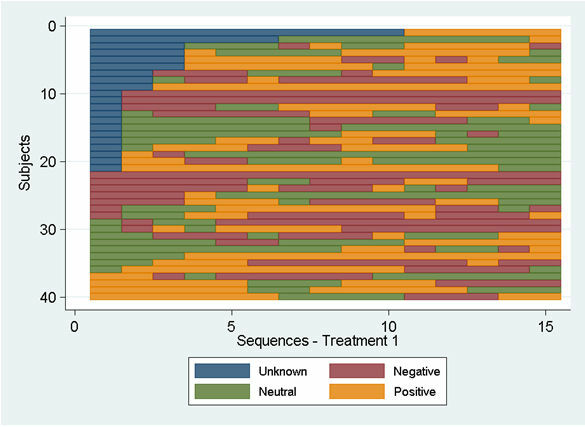 The figure plots with a different colour the rating obtained by the subjects participating in the treatment for each period of the game. Figure 5. Sequence of B's ratings in treatment Inf. 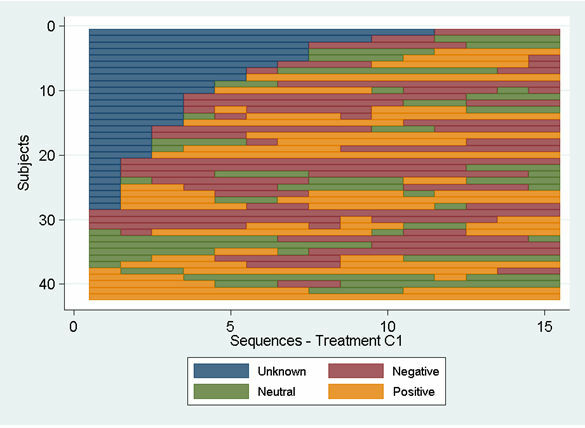 The figure plots with a different colour the rating obtained by the subjects participating in the treatment for each period of the game. 4.14 In order to further analyse our treatments, simultaneously taking into account the panel structure of the data, we estimated a number of random effects panel regression models comparing the different treatments (Baltagi, 2001; for an application of random effects models to experimental data, see Barrera and Buskens, 2009, Boero et al., 2009). In the models with A investment as a dependent variable, the regressors were a dummy indicating the relevant treatment plus the amount received by the subjects last time they played as A and as B in the game (respectively "prevA" and "prevB" in the tables below). The same regressors were used when the dependent variable were B returns, with a further control variable represented by the amount invested by A in the current period (actualdaAaB). 4.15 Starting from treatments 1 and C1, no significant effect between the two treatments was observed if we focused on A's investment as the dependent variable, while a significant effect (at the 10% level) was found for the coefficient of the amount received in previous periods when the subject was playing A and B (see Table 5.a). On the other hand, when considered B's returns as the dependent variable, there was a negative and significant effect of the treatment (see Table 5.b). The coefficients of the variable representing the current A investment and the amount received by B last time he/she played as A were also significant. 4.16 Tables 6.a and 6.b show the coefficients estimates when we compared treatments 1 and Inf, where the role of the C "gossipers" was introduced, using respectively A investment and B returns as dependent. The treatment coefficient was not significant considering A investment. 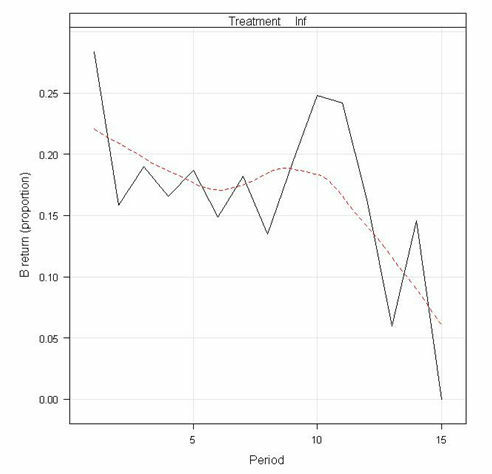 On the other hand, when considering B's return as dependent, the treatment coefficient had a strong and significant negative effect, while both the amount invested by the current A and the amount received last time the current B played as A show positive and significant effects. 4.17 The comparison between treatment C1 and Inf had a negative but not significant effect of the treatment for the model with A investment as dependent and a negative and weakly significant (at the 10% level) effect for the one with B returns as dependent (see Tables 7.a and 7.b). The coefficients of the amounts received the last time the current subject played as both A and B were positive and significant when considering A's investment as dependent (see Table 7.a). On the other hand, only the amount sent by the current A had a significant effect when B's return was considered as dependent (see Table 7.b). 4.18 The same was true when comparing treatments 2 and C2. There was no significant difference between them when considering A investment (see Table 8.a) and B returns (see Table 8.b) as dependents. Significant and positive effects of coefficients were present for the amount received in the last period when the current subject played as A, considering A investment as dependent, and for amounts sent by the current A considering B returns as dependent (see Table 8.b). 4.19 The last comparison was between treatments 3 and C3. Considering A investments as dependent, the only significant coefficient was the amount received by the current subject last time he/she played as A (see Table 9.a). When B returns were dependent, the amount sent by the current A was positive and highly significant (see Table 9.b). 5.1 The experiments in this paper have lead to at least five main findings that could improve our understanding of the role of reputation-based trust in cooperation. Firstly, our experiments confirmed that individuals tend to be sensitive to their reputation even when this does not affect their material payoffs. This is an interesting finding considered that, in our experiments: (i) players were interacting anonymously with random unknown partners, (ii) there was no social structure effect, as players were randomly assigned to the roles in each period, and (iii) they were subject to economic incentives, which are expected to enforce self-interest motivation. 5.2 Let us suppose that these conditions were nullified, i.e., there was no economic incentive, actors were embedded in a dense social structure and they were interacting with identifiable partners: in this case, it is expected that trust and cooperation could easily be created. Vice-versa, a rational choice account will predict no trust or cooperation when conditions (i), (ii) and (iii) were present, as in our experiments. Therefore, it is especially interesting that, in our experiments: (a) against the prediction of the rational choice theory, players did not take into account only the material self-interest consequences of their behaviour while taking economic decisions; (b) their behaviour was consistent with widespread social norms, such as fairness and trust responsiveness (e.g. Rabin, 1993; Pelligra, 2005), even when this would eventually have reduced their expected pay-off and even if information (i.e., reputational information) was undoubtedly ambiguous, uncertain, and subjectively biased (like in our experiments); (c) they complied with social norms although they were not embedded in a dense social structure, interactions were anonymous, and social sanctions were absent. 5.3 A related finding was the fact that reputation scores by third parties were fair and helpful for A players, despite the fact that subjects in C positions had no actual incentive to commit themselves to the task (i.e., no payoff was linked to their actions). Nevertheless, our experiment shows that, without incentives, a predisposition to fairness tended to guide evaluators' actions. At the same time, A players tended to trust the score expressed by third parties, just as they trusted those that emerged from the dyadic interaction in Boero et al. (2009) experiment. 5.4 More generally, the fact that subjects were so prone to give a fair evaluation of others' actions and to trust these judgements was probably linked with the important role that reputation plays in human society. The position of third parties in our experiment was actually similar to the one that individuals hold in a number of common and not so common human activities, ranging from making comments of one's neighbour actions to writing a review for a scientific journal. 5.5 A third finding helps overcome certain limitations of the standard investment game literature, by paying more attention to the sociological aspects (e.g. Swedberg, 2001). In the standard experimental literature, one of the strongest and most unrealistic assumption is that information on past behaviour of a player, when available is always true for the counterpart. As a consequence, information asymmetries and the formation of reputation are taken for granted (Guennif and Revest, 2005). On the contrary, sociological findings have shown the relevance of information that flows within interaction networks and of third parties as "intermediaries of trust", e.g., in large and dynamic networks where it is expected to find high levels of information asymmetries and high uncertainty on partners' trustworthiness (e.g. Burt 2005; Corten and Cook, 2008). In this respect, our experimental evidence suggests that trust can also be promoted by third party reputation in random social interactions. 5.6 A fourth finding is that third-party reputation can be a reputation system at least as reliable as dyadic reputation, but which is more sensitive to strategy fluctuations and consequently less stable in the long term. This could be investigated in more detail in the future through a simulation model to verify long-time consequences of experimental behavioural patterns. 5.7 Finally, although it was clear that in our experiments, reputation mechanisms "encapsulated" trust - to paraphrase Cook, Hardin and Levi (2005) - the effect of third parties on trust can be positive provided that they are perceived by other players to be responsible for the reputational information that they transmit. This could explain the worse performance of treatment Inf compared with 1 and C1, where reputation was based on reputation scores expressed directly by the same players or by C players who were fully responsible for assigning the score. 5.8 This evidence could have an interesting implication on the reputational effect on markets and, in particular, on auditing (e.g. Power, 2007). Our experimental results suggest that, to promote cooperation in triadic relations between investors, trustees and third parties, the latter should be perceived by others as being fully committed to the evaluation they elaborate. Of course, this last point needs further elaborations and experimental treatments. 5.9 Further treatments could integrate the previous ones by: (i) adding economic incentives to the third parties, respectively aligned to investors and trustees pay-offs; (ii) providing a fixed structure of the roles. These two modifications could allow us to verify whether economic incentives can strengthen or blunt the reputation-based trust mechanisms described in this paper, and whether a perceived fixed structure of roles, i.e., a functional specialisation of the subjects' roles involved in the game, can provide more robust social order-like outcomes. Financial support was provided by a FIRB 2003 grant (Strategic Program on Human, Economic and Social Sciences) from the Italian Ministry for the University and the Scientific Research (SOCRATE Research Project, Protocol: RBNE03Y338_002). A first version of this paper has been presented at a seminar held at the Department of Sociology, Utrecht University in February 2009 and at the ICORE-International Conference on Reputation: Theory and Technology, held in Italy, in March 2009. We would like to thank Vincent Buskens, Rosaria Conte, Rense Corten and three anonymous ICORE conference referees for very helpful remarks and comments. We gratefully acknowledge the useful comments of an anonymous reviewer and the feedbacks from the editors. Finally, we would like to thank Robert Coates, Centro Linguistico, Bocconi University of Milan, for the linguistic revision of the text. Usual disclaimers apply. 1 It is worth mentioning that the problem of generalization also characterizes more conventional social science methods, such as qualitative case-studies or field surveys (e.g. George and Bennet 2004). In our opinion, Swanson's argument (1951, 358) that "the validity of the generalizations coming from such studies [the laboratory experiments] is to be judged by the same criteria as those used in field studies" still holds true. 2 With the expression "cognitive/normative side of reputation" we emphasized the idea of a psychological mechanism, acting at a largely unconscious level and leading subjects to increase cooperation in conditions where their behaviour can be observed and/or judged by others, even when this has no actual effects. Besides the Boero et al. (2009) experiment, a number of recent studies support this idea (e.g. Bateson et al., 2006; Burnham and Hare, 2007; Haley and Fessler, 2005). 3 The average earning of the subjects closely approximated the average hourly labour cost of the Italian industry sector (excluded agriculture and public sector), taxes included (source: Eurispes, on Eurostat Yearbook 2006-2007). 4 Even if the distribution of the absolute amounts returned by B players in treatment C3 was significantly lower than the one in treatment 3 at the 10% level. GEE, W (1950) Social Science Research Methods, New York: Appleton-Century-Crofts. GERRING, J & McDERMOTT, R (2007) 'An Experimental Template for Case Study Research' in American Journal of Political Science, 51, 3: 688-701. GOFFMAN, E (1959) The Presentation of Self in Everyday Life, New York: Anchor Books. HORNE, C & LOVAGLIA, M J (eds) (2008) Experiments in Criminology and Law: A Research Revolution, Plymouth: Rowan & Littlefield Publishers. KOLLOCK, P (1994) 'The Emergence of Exchange Structures: An Experimental Study of Uncertainty, Commitment, and Trust' in American Journal of Sociology, 100: 313-345. LAWLER, E J, YOON, J (1993) 'Power and the Emergence of Commitment Behaviour in Negotiated Exchange' in American Journal of Sociology, 58: 465-481. OSTROM, E (2006) 'The Added Value of Laboratory Experiments for the Study of Institutions and Common-Pool Resources' in Journal of Economic Behavior & Organization, 61: 149-163. WILLER, D (1997) Theory and the Experimental Investigation of Social Structures, New York: Gordon and Breach Publishers.